The Precious Plastic Shredder was finally delivered to our customer! We made a demo video that shows how to maintain and unclog the shredder, so watch it in action here. 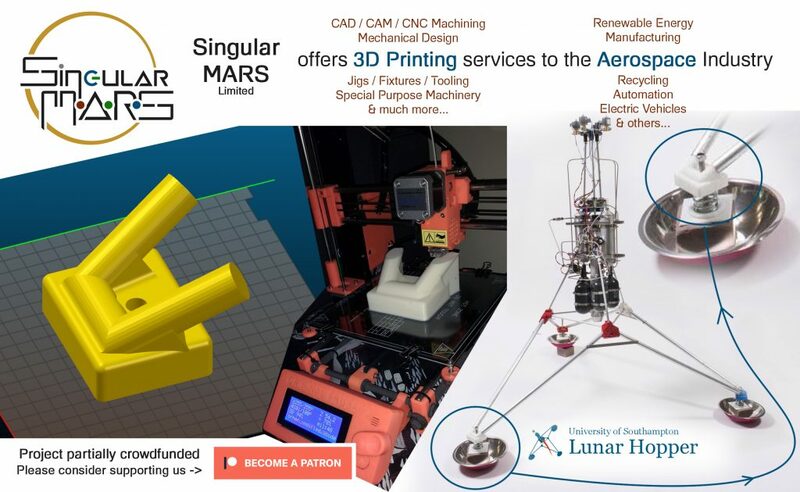 We’re back again working with the University of Southampton’s Lunar Hopper group. They required more 3D printed parts for their new prototype and we were able to offer them a discount thanks to your donations, patrons! In addition to our regular donations to Dave Hakkens, Fully Charged Show, Greenpeace and Wikipedia, we’re now supporting here on Patreon Scott Santens, someone who advocates for an Universal Basic Income “for a living”. As we believe in this idea and see the benefits of a world a bit more free from labor thanks to automation, we’re helping him with our donations to spread the word. Please consider supporting us so that we can keep getting involved on these exciting projects, and don’t forget to follow us on Twitter, Facebook, Instagram and LinkedIn.